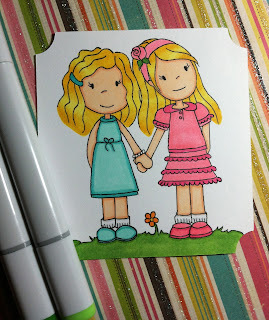 Paper Nest Dolls: Friends Forever + A Tutorial! Happy Monday, everyone! Hope your week is off to a great start. :) Ashley here from Made Especially For You. 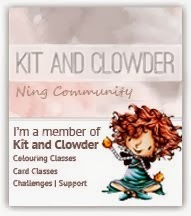 Today I'd like to share with you a tutorial and a card I made to go along with it. It's all about how to cut a digital stamp using a Cricut! For those of you who have researched the Cricut/Cameo debate (and that's a whole other post in and of itself) you know that many argue in defense of the Cameo because of it's ability to incorporate digital stamps into the Silhouette software and then cut them using your machine, one of the reasons I purchased a Cameo in addition to my Cricut Expression, but I'm a neutral party. :) However what many don't realize is that digital stamps CAN be cut using a Cricut! 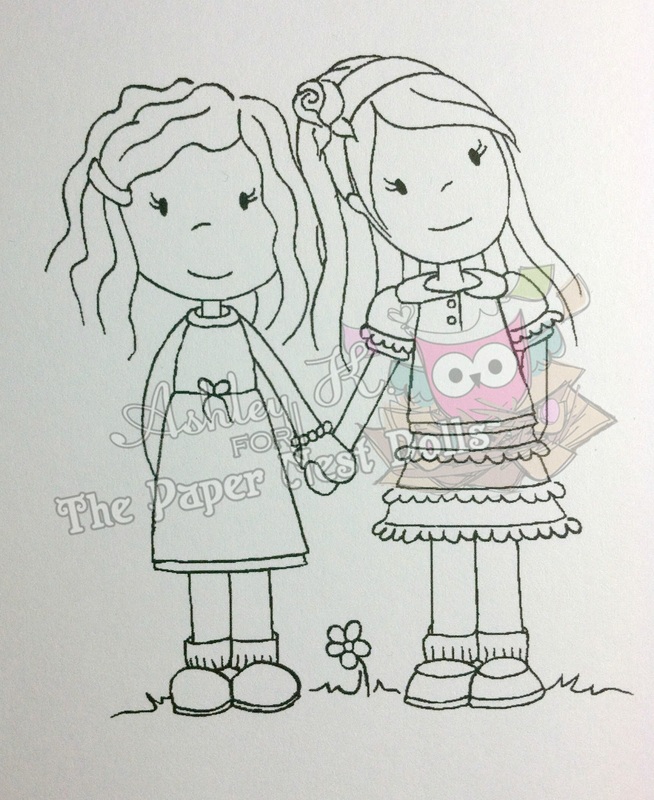 While an exact outline around the image cannot be cut, shapes from cartridges can be used to give your digital stamps fun borders other than the basic square/rectangle. 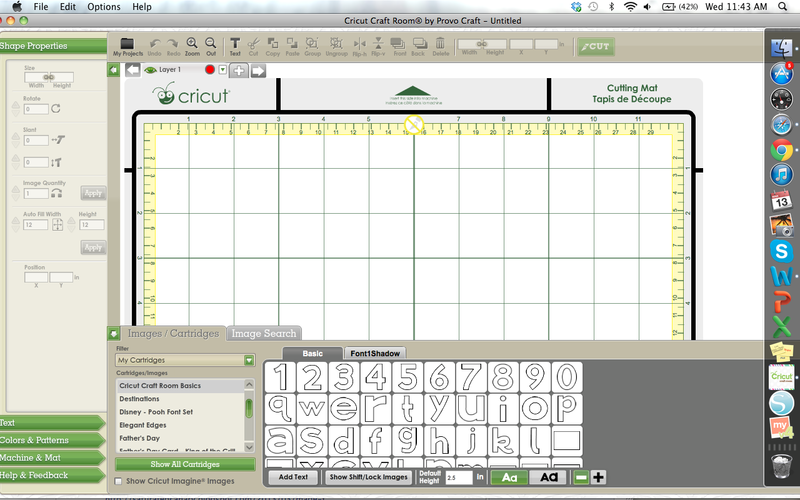 To cut a digital stamp using a Cricut, your'e going to need to make a stencil, so to speak. Once your stencil is made, you will use this to place your digi on the mat in the same spot your stencil was cut. This way when you cut the stencil again, it will cut around your digi in the exact same spot, leaving you with a fun shape cut around your digital stamp! Step 1: Print your digi! 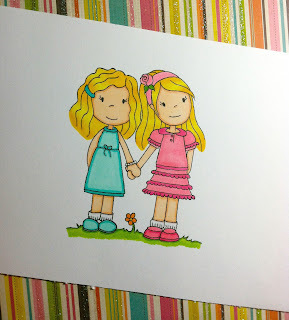 This image is called "Best Friends and Sisters" can be found here in The Paper Nest Dolls shop. Make sure when printing to leave at least an inch around all sides of your image to leave room for cutting a shape around your image. Step 2: Color your digi! 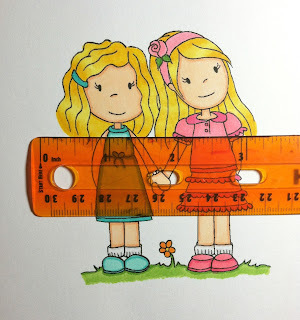 Step 3: Measure the horizontal length of your stamp. In order to make sure your digi is centered when using your Cricut to cut it out, you must find the approximate size of the shape you'll be needing to cut. To do so, use a ruler to "center" your digi. You'll see that my stamp above is centered when the width is about 3.75 inches. 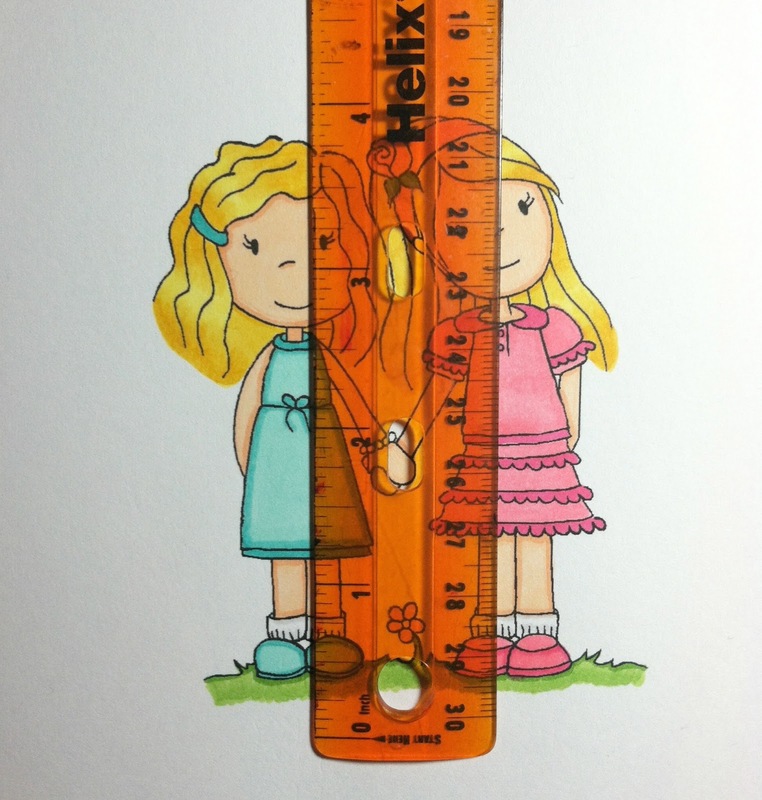 Always make sure to measure from the widest part of the stamp, in this case it would be the tips of the girls' hair. 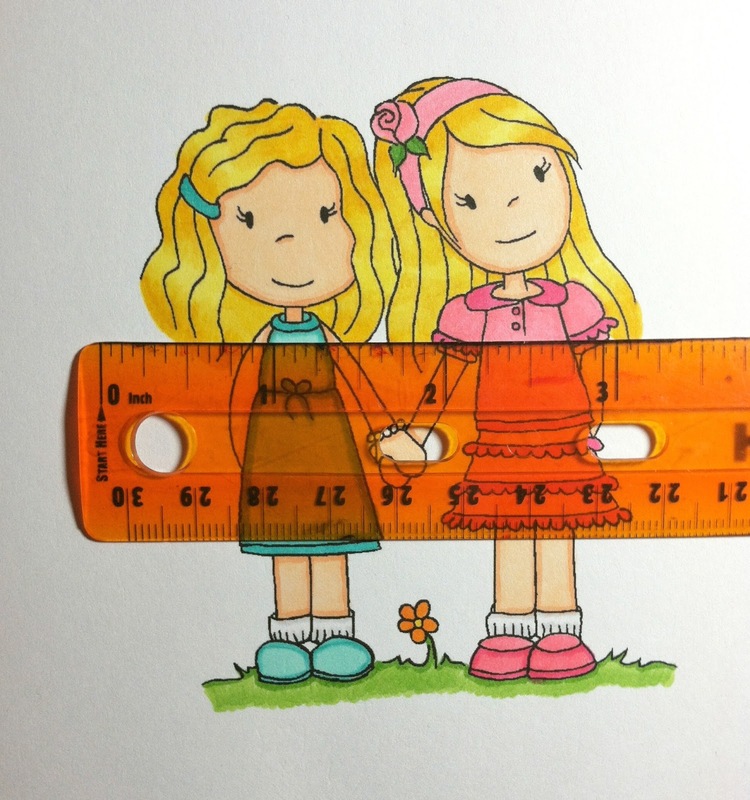 If you were to measure from their legs, then when you go to cut the shape, your image is going to be cut, too. This will make sense in just a bit. :) Keep in mind that now I know the width of my shape will need to be 3.5 inches in order for the stamp to be centered when I use my Cricut to cut around it. Step 4. 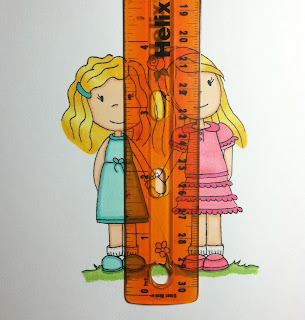 Measure the vertical length of your stamp. 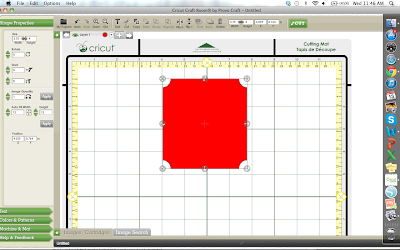 Now that you've measured the width of the shape you're going to cut, it's time to measure the length. Using a ruler and the same technique as in Step 3, center your image vertically. Here you will see my image is centered at about 4 inches. Now I know the height of my shape will need to be 4 inches. Step 5: Open Cricut Craft Room! Step 6: Decide what shape you'd like your digital image to be! I've chosen to use the above frame from the Elegant Edges cartridge - one of my favorites to use for cutting digis! Hint: placing your image in the center of the mat is going to make cutting out your digi much easier and less frustrating. Step 7: Size your shape to the measurements you took in steps 3 and 4. 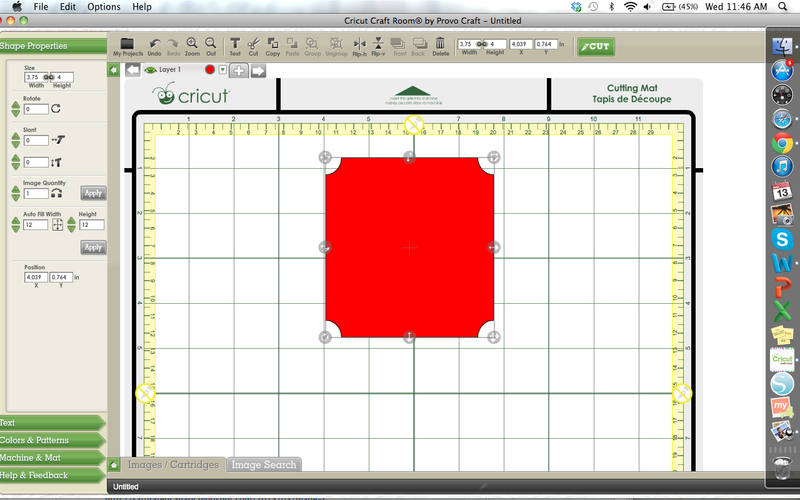 This is a screenshot of the top righthand corner in CCR where it tells you the size of your image when you click on it. I made my image 3.75 inches wide and 4 inches tall to ensure my image will be placed in the center of the shape I cut. Step 8: Load your mat and get ready to cut! Step 9: Cut your stencil! A little bit hard to see here, but my stencil has successfully been cut. Step 10: Remove the cut shape. Step 11: Prepare to cut around your digital stamp. Leaving the stencil ON the mat (and paying close attention to where it is located in case it accidentally comes off - for example I used a horizontal piece of 8.5 x 11 cardstock, so I centered my paper so there was only half an inch left on the mat on both sides), slide the paper with your digital stamp underneath to get an idea of where it will need to be located on the map. It might take a few tries to get the image directly underneath the stencil so that the image is centered. But don't worry, if you measured correctly, all it will take is a few minutes and some shimmies to get that image smack dab in the middle. :) Does this picture better explain how the stencil is being used? 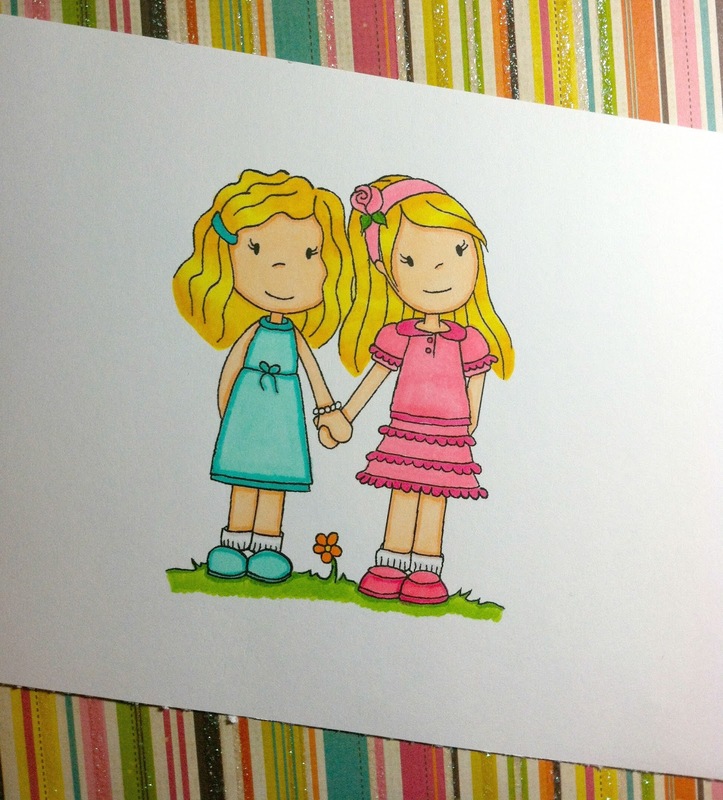 It's a template for where to place your digital stamp on the mat so that the image cuts perfectly around it. Once you've got your stamp centered within the stencil exactly where you want it, it's time to get ready to cut! Don't worry if things need to be touched up to fit your image (such as the grass at the bottom of mine) that can be done once the cutting is complete. Step 14: Remove your stencil. Now that your stencil has served its purpose, you can go ahead and remove it from the mat. Just be careful to not take your stamp with it! Step 15: Don't be scared, it's time to get ready to cut! Load that bad boy back into your Cricut. :) Your CCR should still have been left open from when you cut the stencil. Make sure to NOT touch the shape in CCR in between cutting the stencil and cutting around your digi, otherwise the position on the mat will be different and your image will not cut so that your stamp is in the center. The image is now in the center of the fun shape you used to make your stencil! Step 17: Add the final touches to your image, if needed. You'll see I went back and touched up the grass to fit the border of the shape. Often times touch ups will be needed, and that's perfectly okay. Step 18: Add it to your project! Place your digital stamp on your project and there you have it! 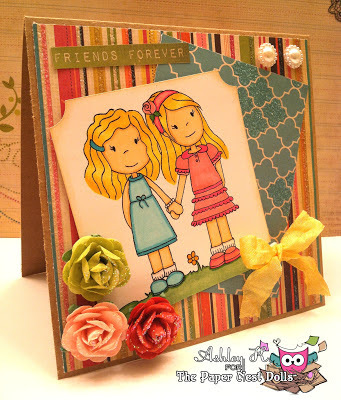 A way to give your digital stamps fun shapes other than the basic square/rectangle if you don't have a Cameo or other cutting machine, or if you prefer cutting electronically versus using metal dies. It can take a bit of practice to align the images the way you want, but overall it's a fairly simple process. TIP: When trying this for the first time, it may be helpful to cut the digi BEFORE coloring it in case it doesn't turn out the way you wanted it - I've learned that lesson the hard way :) Then you don't spend time coloring the image only for it to not be able to get used. Excellent Tutorial!!! I was always wondering how to do that. Your explanation was clear and concise and the photos were helpful. Thanks! Wow thank you for this fabulous tutorial. will defiantly be trying this out with my new cricut. :) Hugs From Ami.